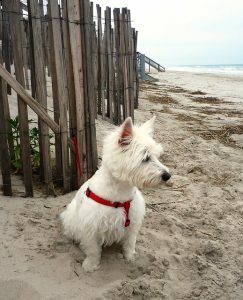 Are Dogs Allowed On The Beach In The Outer Banks? Each beach has different rules and regulations, so we’ve collected them all and put them together in one convenient place. 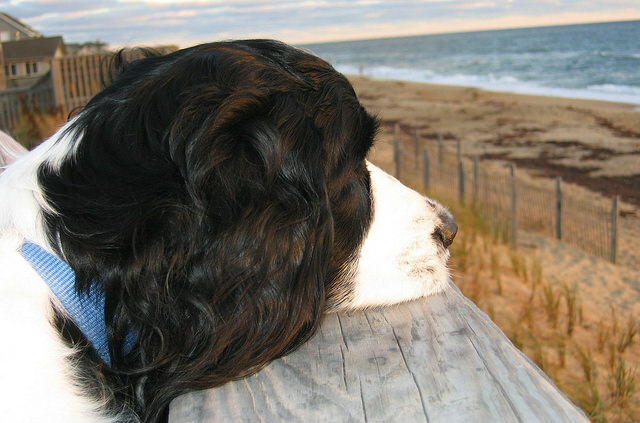 Browse the list below to determine which OBX town is the best fit for your four-legged family member or to jump directly to the town you’re interested in. 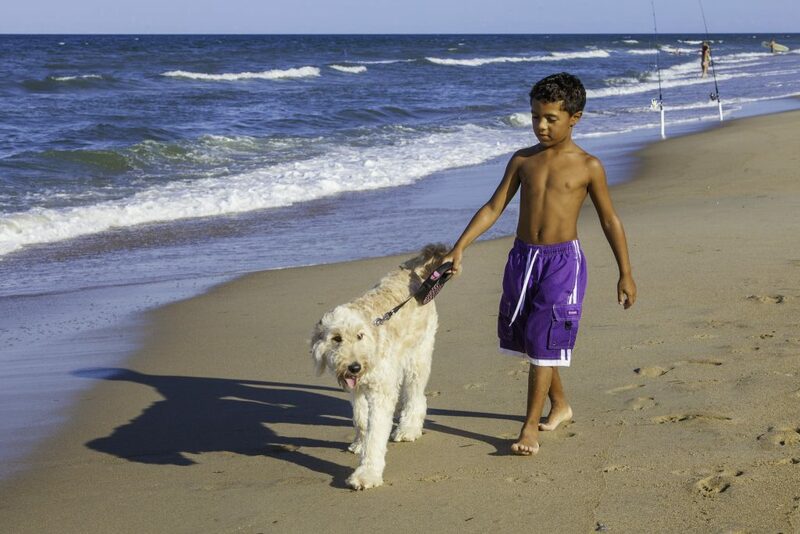 Dogs are allowed on OBX beaches, however, each town has different pet regulations. Some beaches restrict the times that dogs can be on the beach. Dogs are allowed on the beach in Nags Head, Kill Devil Hills, Kitty Hawk, Southern Shores, Duck, Corolla, and the 4×4 beaches. The rules vary greatly in each town. Use the links below to jump directly to the town you’re staying in to familiarize yourself with rules for dogs on the beach. One rule that exists on all dog friendly beaches: always clean up after your dog! If you’re traveling from the north, Kitty Hawk is the first Outer Banks town you’ll encounter when crossing the Wright Memorial Bridge. Dogs are allowed on Kitty Hawk beaches, but the regulations are different depending on the time of year that you visit. From the Friday before Memorial Day through the day after Labor Day, dogs must be on a leash that does not exceed 6 feet. During the rest of the year, a leash retractable to 12 feet is required. Well-behaved dogs are allowed to be unleashed on the beach as long as they do not disturb other people or dogs. The dog’s owner must always be within 30 feet of the unleashed dog and dog owners must always have a leash in their possession. Dogs must also display a current rabies tag at all times. Part of Kitty Hawk’s charm is its village, located on the sound side of the town, where horses and farm animals are permitted for residents. You may see Kitty Hawk residents on horseback, riding through the village or on the beach, from 30 minutes before sunrise until 10:00 am and from 6:00 pm until 30 minutes after sunset from May 15th to September 15th, or at any other time of the year, from 30 minutes before sunrise until 30 minutes after sunset. It’s a fun treat to see a horseback rider on the beach, but it’s also something to keep in mind if your dog is not used to seeing horses. Nags Head is one of the larger towns on the Outer Banks, with a population that includes residents and visitors. While some Outer Banks towns have strict regulations, Nags Head dog rules are a bit more relaxed. Leashed dogs are allowed on the beaches at all times. There is no leash length requirement, but dog owners must clean up after their pets at all times and deposit waste in the proper trash receptacle. In addition to the beach, Nags Head features several multi-use paths and a dog park. The dog park in Nags Head is located at 227 West Satterfield Landing Road, and parking is available. There are separate fenced areas for large and small dogs, with water available (except during winter months) and pet waste bags. The Nags Head dog park is free and open to the public. With no paved roads, the 4×4 beaches provide the ultimate off-road Outer Banks vacation experience. 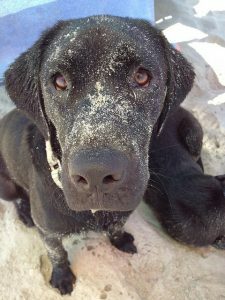 The 4×4 beaches are dog friendly all year long. Dogs must remain on a leash at all times, but there is not a leash length requirement. Dogs staying leashed is best for the 4×4 beaches due to the beach being used for vehicle travel. Also, keep in mind that the Corolla wild horses roam freely on the 4×4 beaches as well as in the vacation home’s yards. Kill Devil Hills is widely considered to be the epicenter of the Outer Banks. Dogs are allowed on the beach, however, there are time restrictions. Between Memorial Day and Labor Day, from 9:00 am to 6:00 pm, dogs are not permitted at all. At all other times, dogs that are leashed and under the owner’s control are allowed on the beach. Southern Shores is mainly a residential coastal town, which means less commercialization and a slower pace. The beautiful beaches are the primary focus in Southern Shores. Leashed dogs are permitted on the beach in Southern Shores, but there are time restrictions. From May 15th to September 15th, dogs are not allowed on the beach between 9:00 am and 6:00 pm. During the rest of the year, dogs are allowed on the beach at any time as long as they are on a leash. There are no leash length requirements. Corolla is the OBX beach town that has it all – gorgeous beaches, great restaurants, unique shops, tons of activities, and a rich history. 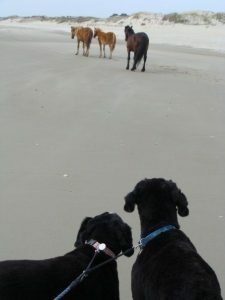 Corolla beaches are dog friendly all year long, but leashes are required. There are no leash length requirements. Looking for other things to do in Corolla with your dog? Historic Corolla Park and nearby Corolla Village are wonderful places to spend an afternoon with your pet. It features open green spaces with walkways throughout. Pets are welcome at select special events held on the grounds, such as the family-friendly Whalehead Wednesday, which features wine and beer tastings and live music. Located just north of Historic Corolla Park, Corolla Village offers pet-friendly places to grab a bite to eat or a cold drink. Corolla Village BBQ and The Beer Garden are essential stops during your visit to Corolla Village – both welcome dogs. Duck is a gem of a town, featuring beautiful waterfronts on both the ocean and the sound. It has been named one of the most dog friendly beaches in NC, and is arguably the most dog friendly of all Outer Banks towns. Dogs are allowed on the beach year-round, can play on the beach unleashed, but must be under the control of the owner at all times. Dog waste must be cleaned up and placed in a trash receptacle. Along with the beach, the village of Duck is dog friendly. Walk your dog along Duck’s Soundside Boardwalk, which runs approximately a mile along the Currituck Sound in Duck Village and features wide walkways and multiple access points. Most of the eateries along the Duck Boardwalk have outdoor seating, and many will allow your furry friends to join you for a meal. On the east side of Route 12 in Duck Village, there are several pet friendly locales that offer eclectic outdoor areas. Dogs must be leashed when in Duck Village, including at Duck Town Park and on the boardwalk. At the Waterfront Shoppes on the northern end of Duck’s boardwalk, be sure to stop by Outer Barks. They offer a weekly “Yappy Hour” on Tuesday afternoons at the Bluepoint Restaurant’s Back Bar. Dogs can enjoy doggie daiquiris, all-natural dog treats (baked daily in the store) and paw print painting. 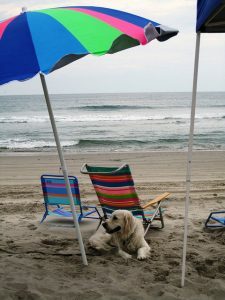 Is the Outer Banks dog friendly? Absolutely! But if you are looking to spend long summer days at the beach, keep the following towns in mind when searching for a pet friendly place to stay. These towns have a leash length requirement or restricted beach access times for dogs during the summer months. Southern Shores: dogs are not allowed on the beach from 9:00 am to 6:00 pm between May 15th and September 15th. Kitty Hawk: Dogs must be on a leash that does not exceed 6 feet from the Friday before Memorial Day until the Tuesday after Labor Day. Kill Devil Hills: Dogs are not allowed on the beach from 9:00 am to 6:00 pm from Memorial Day to Labor Day. Sand gets hot during the summer. Hot enough to burn your dog’s paws. The ideal time to walk your dog on the beach is in the morning or evening. Be sure to fill in any holes that your dog digs. Fleas and ticks are abundant on the Outer Banks. Be sure your pet is protected prior to your visit. Pay attention to any red flag warnings on the beach if the ocean is rough. Dogs can get swept out in rip currents too. 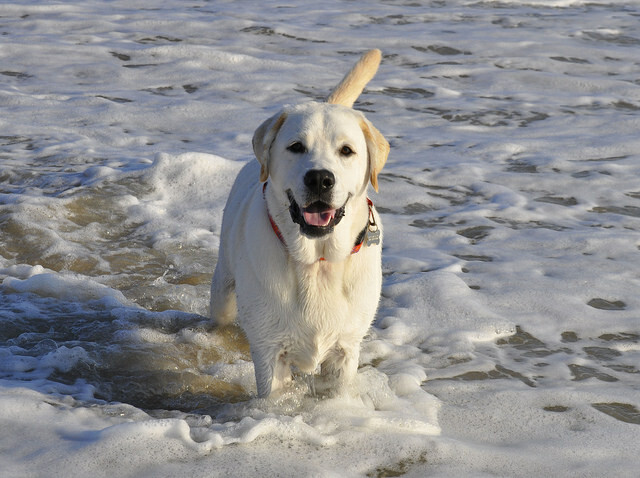 Drinking salt water can make dogs sick, so be sure to pack a bowl and fresh water for your dog to drink at the beach. Along with fresh water, a beach umbrella or tent are also a good idea to offer your pet some relief from the warm sunshine. If you choose to fish or crab during your vacation with your dog around, be aware of the dangers that fish hooks can pose. Dogs love to eat stinky bait and usually do not realize that there could be a sharp object attached. ALWAYS clean up after your dog! 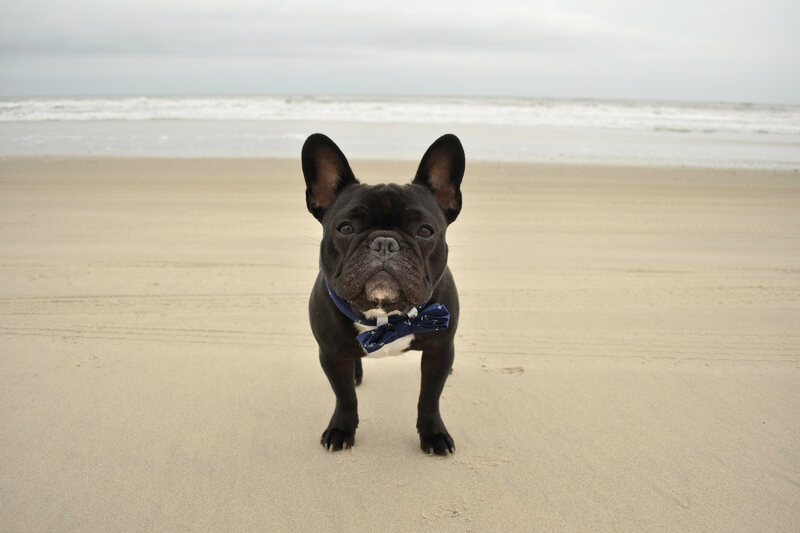 Do not bury pet waste on the beach or toss it into the ocean. Most beach accesses have a trash can and many feature pet waste stations with bags for cleanup. 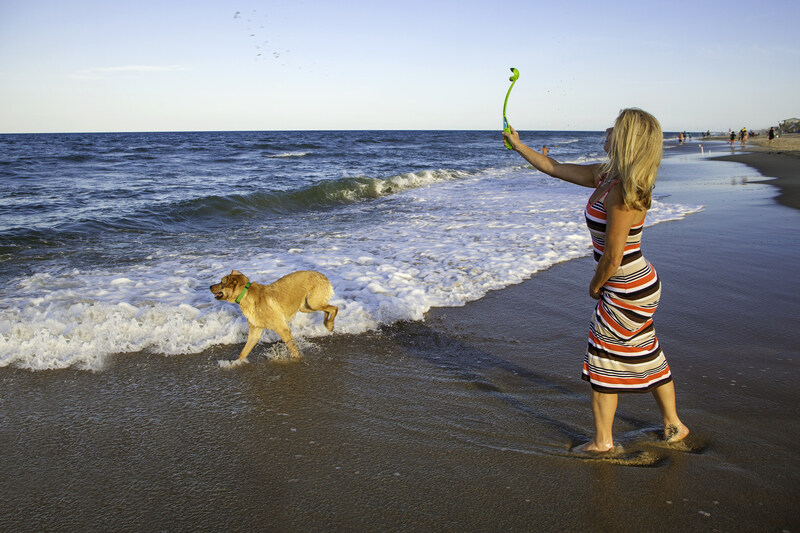 Now that you know where you’re allowed to take your furry friend during your visit to the OBX, keep reading to learn more about our favorite dog-friendly activities in the Outer Banks.